Despite a “plurality of transdisciplinary models” (Nicolescu, 2008c, p. 13), the full range of transdisciplinarity has not yet been fully grasped and tabulated (du Plessis, Sehume, & Martin, 2013; Jahn, 2012). However, two approaches to transdisciplinary tend to prevail: (a) the Nicolescuian approach and (b) the Zurich approach (Klein, 2004, McGregor, 2014, 2015; Nicolescu, 2006, 2008c; Nowonty, 2003). People tend to cite one or the other of the two approaches (readily evident from reading their reference list). Familiarity with both approaches is recommended because each one yields different insights into the complex problems facing humanity. To that end, this article is an inaugural attempt to provide a detailed explanation of the fundamental differences between these two approaches. As a caveat, others have thoroughly documented the evolution of the concept of transdisciplinarity, starting with the Organization for Economic Cooperation and Development’s (OECD) conference in 1970, where the term was first coined by Jean Piaget (Nicolescu, 2006) (see Augsburg, 2014; Bridgeman & Brooker, 2004; Klein, 2003, 2004, 2014; McGregor, 2010; Segalàs & Tejedor, 2013). The Nicolescuian approach was developed and is espoused by Professor Dr. Basarab Nicolescu, a Romanian quantum physicist based in Paris, France. Starting in the late seventies, he ‘worked out’ a methodology of transdisciplinarity (with three axioms) and then strategically arranged for its dissemination in a series of books and congresses. Although the methodology did not emerge at these events (i.e., it already existed), an international community of transdisciplinary researchers did emerge, and continues to do so (Nicolescu, 2008a). The articulation of this methodology began with his 1985 book entitled Nous, la particule et le monde (Us, the Particle and the World) (Nicolescu, 1985). Two years later (1987), he established CIRET in Paris (the International Center for Transdisciplinary Research). Members are now referred to as “the scientists of CIRET, Paris” (Bertea, 2005, p.2), with a very inclusive understanding of scientists. Nicolescu helped formulate the Charter of Transdisciplinarity at the First World Congress of Transdisciplinarity held in Portugal in 1994 (de Freitas, Morin, & Nicolescu, 1994). The President of Portugal attended along with 83 other participants, representing academics, civil society, industry, and governments. He then helped organize the 1997 Locarno International Congress of Transdisciplinarity (focused on universities) as well as the 2005 Second World Congress of Transdisciplinarity (Brazil) (Nicolescu, 2008a,b). His approach to transdisciplinarity continues to evolve, witnessed by his recent book on transdisciplinarity and cosmodernity (Nicolescu, 2014). But fundamentally, Nicolescu’s conceptualization of transdisciplinarity is grounded in the tenets of metaphysics, quantum physics, and complexity science. It comprises a new methodology for creating knowledge to understand the world, replete with three axioms: ontology (Multiple Levels of Reality, with movement among them mediated by the Hidden Third); the Logic of the Included Middle; and, epistemology (knowledge as complex and emergent) (to be discussed later). The other dominant approach to transdisciplinarity stems from a March 2000 congress in Zurich, Switzerland, co-organized by Roland Scholz. Klein et al.’s (2001) book contains the congress proceedings. Called the Zurich approach, nearly 800 people from more than 42 countries attended, including industry, government, and academics (nearly 40 disciplines) (Klein, 2003). Nicolescu was initially involved with the Scientific Council for this conference (2008a). The goals of the conference were to develop transdisciplinary practice, promote transdisciplinary research, and create favourable institutional structures and power incentives. This has been described as “the latest transdisciplinary approach” (Segalàs & Tejedor, 2013, p. 13). At the Zurich meeting, “the integration of the imperatives of science, democracy, humanities and economy was promoted” (du Plessis et al., 2013, p. 55). Just as CIRET evolved out of Nicolescu’s earlier efforts, the Swiss-based Network for Transdisciplinarity Research (known as td-net) emerged subsequent to the Zurich meeting, in 2002. It is now considered to be the primary Swiss contact point for researchers and funders in the fields of inter- and transdisciplinary research and teaching who follow the Zurich approach. Contributors to the 2000 Zurich congress drew on Gibbons et al.’s (1994) Mode 2 approach to knowledge production and their definition of transdisciplinarity and, to a lesser extent, Ravetz and Funtowicz’s (1999) concept of postnormal science (to be discussed shortly) (Klein et al., 2001). During this time frame, the discussion and discourse around transdisciplinarity was mainly fuelled by Mode 2 knowledge production and postnormal science (Jahn, 2012). Gibbons and his colleagues “generalized [the] key features of transdisciplinarity – heterogeneity, social responsibility and contextuality – into a new [way to produce scientific knowledge]” (Jahn, 2012, p. 2). As an aside, both initiatives were aware of each other, but opted to advance different approaches to transdisciplinarity. At the 1994 First World Congress of Transdisciplinarity, attendees recognized Gibbons et al.’s (1994) Mode 2 definition of transdisciplinarity as relevant (subsequently embraced at the 2000 Zurich congress) but opted instead to follow Nicolescu’s approach (Klein, 1994). Klein et al. (2001) described the Zurich congress as a pivotal event in the evolution of discourse about transdisciplinarity, acknowledging Nicolescu’s contributions as fundamental to transdisciplinary epistemology (p.40), but the Zurich approach did not want a methodology. In a telling move, while attending the Zurich congress, advocates of the Nicolescuian approach prepared a formal statement for the Zurich attendees, urging them to consider the merits of both approaches (Brenner et al., ca. 2000). This statement was partially published in the book that emerged from the conference as an Appendix titled Manifesto: A broader view of transdisciplinarity (Klein et al., 2001, see pp. 131-132). Diversity in approaches to trandisciplinarity is desirable. In his discussion of the views expressed at the Zurich congress, Nicolescu (2003, 2006) described his approach to trandisciplinarity as theoretical and the Zurich approach as phenomenological (and he identified experimental transdisciplinarity as a third avenue, that being data collection across disciplines and topical fields). He ardently believed that “the huge potential of transdisciplinarity will never be realised if we do not accept the simultaneous and rigorous consideration of the three aspects of transdisciplinarity” (p. 145). du Plessis et al. (2013) concurred that “all three approaches are of equal importance, should be treated as such and should be applied simultaneously” (p. 136). Nicolescu respected the Zurich approach, which he said is “characterised by the refusal to formulate any methodology” (2006, p. 144). As noted above, the Zurich congress acknowledged Nicolescu’s approach but opted instead for a new approach to science, research, and politics instead of new methodology (axioms) for creating knowledge. The Zurich approach uses Gibbons et al.’s (1994) conceptualization of transdisciplinarity (Klein et al., 2001). Before profiling the main differences and any similarities between these two approaches, each will be described in detail, including their respective rationales for each approach and an overview of their main components. In most of Nicolescu’s papers, books or in interviews with him, he explains what drove him to formulate his approach to transdisciplinarity (i.e., his three main concerns). First and foremost, he had issues with Modern Science, which was founded on the idea of totally separating humans (the Subject) from reality (the Object). Reality is assumed to be completely independent from the person who is observing it. This assumption is evident in the scientific method, characterized as a value neutral, objective approach to producing knowledge to understand material (physical) reality. Modern science developed independently of theology, philosophy, art, and culture (meaning there was no room for spirituality, meaning of life, aesthetics, beauty, social life, wisdom, traditions and customs). Nicolescu had deep issues with the forced separation of the material world and the human-lived world, and with the sacred. He believed that the extreme consequences of this division, incarnated in the ideology of scientism, has led to the looming disaster of the self-destruction of the species (Nicolescu, 2005, 2014). Second, Nicolescu was concerned with the rate at which disciplinary-bound knowledge was being produced with no connection to the world. Janz (1998) described this “as contextless and meaningless knowledge” (p. 5). du Plessis (2012) referred to “the helplessness of the application of a proliferation of knowledge and knowledge systems” (p. 43). Nicolescu expressed deep misgivings about the plethora of disciplines, noting that around the time of his first book (1985), there were more than 8,000 definable, separate fields of knowledge. Klein (1994) attributed “this staggering number [to] both increasing specialization and interdisciplinary overlaps” (p. 2). Nicolescu maintained that “8,000 disciplines mean 8,000 ways to look for reality. It means a catastrophe for knowledge in some sense because it means there is no unity of knowledge” (2007, p. 77). In more detail, because the intent of transdisciplinarity is to understand the world, there has to be a way to ensure unity of knowledge from disparate sources. By understand, Nicolescu (2007) meant “connecting knowledge with being” (p. 74); that is, connecting the Object (science) with the Subject (humans). When knowledge is created using his transdisciplinary methodology, “it is new knowledge that you cannot reduce to old knowledge” (p. 84). He spoke of the perpetual evolution of knowledge, with this new knowledge reflecting unity of Object and Subject, what he called the coherence of the world (Giosan & Florian, 2002). Third, reflecting the previous two issues, Nicolescu sought to address the problem of fragmentation that plagues contemporary life. He proposed transdisciplinarity as a way to propel us beyond fragmentary dualism (either/or thinking), which caused the antagonisms that produced the complex problems now faced by humanity (Nicolescu, 2001; Voss, 2002). Inspired by Nicolescu’s rationale for a new methodology, Berni (2010) shared an intriguing discussion of the longstanding “antagonism between science and tradition” (p.3). Voss explained that “approaching problems in a transdisciplinary way enables one to move beyond dichotomized thinking, into the space that lies beyond” (2002, p. 114). Nicolescu’s three main concerns stem from his formal training and life work. He is a quantum physicist, not a classical physicist. From a young age, he also read widely and deeply the ideas of key philosophers like Husserl, Heidegger, and Cassirer. The combination of quantum physics and this particular strand of philosophy (with its focus on the life world, lived meaning, and lived phenomena) deeply informed his approach to transdisciplinarity. While crediting scientific methodology, he insists it has its limitations; a new methodology is required to understand the interactions between the Subject and the Object so we can ultimately understand the present world (Nicolescu, 2014). Instead of viewing society as the main concern of transdisciplinarity (like the Zurich approach), Nicolescu believed that “above all the human being is (or ought to be) in the center of any civilized society” (2008c, p. 12). Further, he believed that transdisciplinarity is about the interaction between humans and the sciences (Subject and Object) and not just about producing better hard science (Object), as espoused by the Zurich approach. Many people influenced Nicolescu’s journey toward ‘working out’ a new methodology of transdisciplinarity, as shared in his interview with Russ Volckmann (Nicolescu, 2007); see Giosan and Florian (2002) and Nicolescu (2008a) for other interviews. Nicolescu’s approach is grounded in a marriage of metaphysics (philosophy) and quantum physics. He credited Heisenberg for the notion of levels of reality, Lupasco for his invention of the logic of the included middle, and Boehme for his original thinking about complexity. He credited Piaget with inventing the word transdisciplinarity as a way to accommodate the new knowledge created when people work together at fluctuating boundaries. Axiom three – knowledge as complexity (epistemology); the Principle of Universal Interdependence. Nicolescu (2007) commented that “the three axioms were revolutionary when they were formulated three centuries ago” (p.84), intimating his transdisciplinary methodology is an extension of a long-standing convention around knowledge creation: epistemology, logic, ontology, as well as axiology. Just as modern science has three axioms (i.e., one level of reality (material), the logic of the excluded middle, and knowledge generated using the scientific method), transdisciplinarity has its own twist on these axioms (see above and below). What is new is his assertion that transdisciplinarity identifies with a new knowledge about what is between, across and beyond disciplines (the meaning of trans). Further, while modern science is value neutral (axiology), transdisciplinarity involves values, namely humanistic values, which are generated by the interaction of the three other axioms (Nicolescu, 2007). This mention of humanistic values leads to a discussion of why he felt such a pressing need for transdisciplinarity. Nicolescu (1985) felt that the most important part of his transdisciplinary methodology was his approach to ontology (reality), with its focus on the Subject (i.e., human beings). With modern sciences’ focus on the Object (value neutral), he felt that the answer to what is beyond the disciplines? is the Subject (i.e., subjective feelings, perceptions, interpretations, meanings, intuitions, experiences). “It’s no mystery. What is beyond any discipline? It is, of course, ourselves, the human being” (Nicolescu, 2007, p. 78). He explained that, with transdisciplinarity, “the Subject comes back” (p. 83) from the sidelines where modern science relegated it for so many years. Transdisciplinarity is in fact “about the interaction between the Subject and the Object” (2007, p. 83, emphasis added). With this insight, he “worked out’” (Nicolescu, 2008a, p.193) that there are three components to transdisciplinary ontology (reality), “Subject, Object, and the interaction term” (Nicolescu, 2007, p. 83), with the latter called the mediating Hidden Third. In more detail, Nicolescu proposed that transdisciplinary (TD) ontology encompasses at least 10 different Realities (disciplinary and sectoral perspectives and view points), aside from just the physical, material reality of conventional science. Per his convention, this paper capitalizes the word Reality when referring to his approach. These 10 Realities are organized along three levels. Level one is the internal world of humans, where consciousness and perspectives flow – the TD-Subject (comprising four Realties: political, social, historical, and individual). 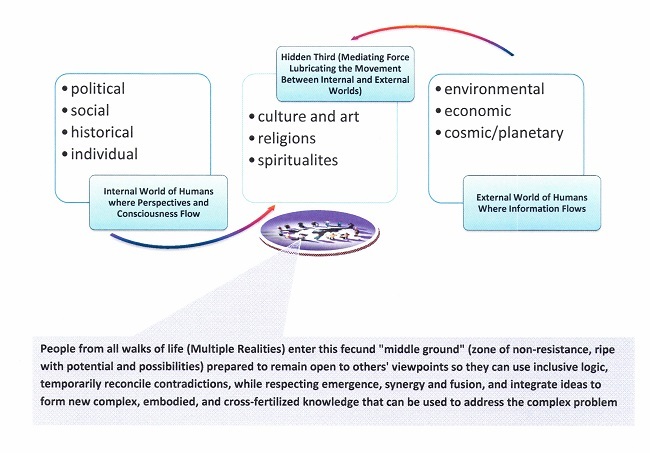 Level two is the external world of humans where information flows – the TD-Object (comprising three different Realities: environmental, economic, and cosmic/planetary). Interaction and movement amongst the previous two levels are mediated by the Hidden Third level. Peoples’ experiences, intuitions, interpretations, descriptions, representations, images, and formulas meet on this third level. As well, three additional Realities exist in this intuitive zone of non-resistance to others’ ideas, this mediated interface: culture and art, religions, and spiritualities (Nicolescu, 1985, 2002), see Figure 1. Paramount to his approach is his premise that every level of reality of the Subject, the Object, and the interaction term is what it is because all of the levels exist at the same time. No one level of reality (perspective, discipline, world view) constitutes a privileged place from which to understand everything. Instead, while each of the 10 Realities is characterized by its incompleteness, in unity, they generate new, infinite transdisciplinary knowledge (Nicolescu, 2005). Nicolescu (1985, 2011) posited that the Hidden Third is a way to conceive of people moving to a place where they become open to others’ perspectives, ideologies, value premises and belief systems, inherently (temporarily) letting go of aspects of how they currently know the world. The Hidden Third (the quantum vacuum) refers to a zone of non-resistance to others’ views on Reality that plays the mediating role of a third between information (Object) and consciousness and perceptions (Subject). For clarification, the quantum vacuum is not empty; rather, it is at its lowest level of energy, ripe with potential and possibilities. In effect, Nicolescu created a new Subject and a new Object, different from that used by modern science. The Transdisciplinary (TD) Object refers to the unity of levels of reality and its complementary zone of non-resistance. The Transdisciplinary (TD) Subject refers to the unity of levels of perceptions and its complementary zone of non-resistance to others’ ideas. What is necessary is that the two zones of non-resistance must be identical in order to have meetings of the minds around contradictory ideas. The Hidden Third acts like a secretly included middle agent that allows for temporary unification of, what is normally, contradictory ideas (Nicolescu, 2005). This latter notion leads us to a discussion of the Logic of the Included Middle, prefaced with the introduction of his attempt to contextualize his axiom of reality. Nicolescu (2002) viewed his three levels of reality as a starting point for the discovery of a series of other levels. He felt his tertiary structure of ‘levels of Reality, levels of perception and the Hidden Third’ needed to be contextualized so it is of value in application in the real world. With that in mind, he deduced a collection of other levels deemed useful for analyzing and solving concrete problems and situations, such as global warming and natural disasters. He referred to this as the contextualization of his transdisciplinary axiom of ontology, made possible by placing it “in the midst of real problems of human life, with all of their complexity” (Nicolescu, 2008b, p. 21). Normally, he presents them in a list of seven, like so: Levels of organization – Levels of structuring – Levels of integration, followed with the next triad. His additional levels are presented here in chart form (see Table 1) so they can be read horizontally (by row, to see progression) or vertically (by column, to appreciate three main categories). He viewed these secondary ternaries as very useful tools for understanding and interpreting the real world. He maintained that the simultaneous consideration, in a given situation of human life, of the basic ternary (see Figure 1) and one or several secondary ternaries (see Table 1) constitutes transdisciplinary hermeneutics (Nicolescu 2008b). Hermeneutics refers to the systematic exposition of what happens in the act of someone understanding something, everything from everyday life to scientific endeavours (van Breda, 2008). Hermeneutics yields knowledge and truth that are focussed on the practical (du Plessis et al., 2014). A focus on the practical, on real world applications, situations and contexts, was why Nicolescu formulated these secondary ternaries (levels comprising three parts each). He explained: “in our times, the area of hermeneutics is that of human life and existence” (Nicolescu, 2008b, p. 21). This means people need to understand how people come to understand their existence as humans and this cannot be achieved unless the focus shifts to the TD Subject (humans) and its interaction with the TD Object (science). Modern science was able to reconcile setting the Subject (humans) on the sidelines because it employs the deductive Logic of Exclusion. It is called exclusive because it negates the possibility of co-existing contradictions; that is, there is no room for opposing ideas to get together. This logic makes it nearly impossible for people with different view points (operating on different Realities) to come to an agreement. That means scientists cannot hear Indigenous peoples, governments cannot hear citizens, industry cannot hear ecologists. This exclusive logic precludes inclusive solutions to humanity’s complex problems, the mandate of transdisciplinarity. In contrast, the Logic of the Included Middle strives to overcome this hangover of separating the Subject and the Object. It is called included middle because transdisciplinarity assumes knowledge is created in the quantum vacuum, the middle ground (see Figure 1). Inclusive logic assumes “that which appears to be disunited is united, and that which appears to be contradictory is perceived as noncontradictory” (Nicolescu, 2008c, p. 7). “Opposing aspects of a phenomenon that are generally considered independent can thus be understood as being in dynamic relationship” (Brenner, 2005, p. 3). In more detail, transdisciplinary quantum logic assumes that when a temporary state of agreement emerges in the included middle, a contradiction is resolved at a higher level of complexity (reality). This new state during complex problem solving represents the result of two contradictory ideas, concepts, assertions et cetera interacting and coming to a temporary resolution (Ramadier, 2004) (e.g., a scientist accepting insights from an indigenous wisdom tradition). This inclusive logic best describes a transdisciplinary picture of reality, where solutions emerge in the fecund middle, the quantum vacuum. The result is new knowledge, layered and layered with complexity, emergent from cross fertilization of so many perspectives. Nicolescu (1985) formulated the axiom of complexity, by which he meant epistemology (what counts as truth and knowledge). Nicolescu (2007) explained that in his transdisciplinary approach, insights and new knowledge are not gained from putting different realities together but from connecting them. He believed that complexity is a modern form of the ancient principle of universal interdependence, in that “everything is dependent on everything else, everything is connected, nothing is separate” (Nicolescu, 2004, p. 48). He elected to use Morin’s (2006) notion of generalized complexity, claiming that it comes the closest to what is needed to deal with transdisciplinary problems. This is likely because Morin viewed complexity through an epistemological lens that respects chaos, disorder, uncertainty, (re)organization, and emergence, rather than within the epistemology of classical science, which privileges order, certainty, stability, and predictability. Disciplinary science isolates disciplines from each other and isolates them from their environments. The breaking up of knowledge into separate disciplines “prevents [knowledge] from linking and contextualizing” (Morin, 2006, p. 14). To confound matters, modern science has persistently separated the Object and the Subject, assuming they are incommensurable, meaning they also remain isolated and unconnected. It goes without saying that creating transdisciplinary knowledge is all about connecting, all about complexity, emergence, and the intellectual fusion of disparate world views into new integral knowledge (McGregor, 2004). Complex transdisciplinary knowledge is created in the fertile middle ground between the mediated Multiple Levels of Reality, using inclusive logic. Indeed, Nicolescu (2010) described the totality of all of the levels of Reality as a complex structure, which necessitates a non-classical understanding of the terms complexity and knowledge. Those engaged in transdisciplinary work must learn to embrace complexity thinking, based on a collection of powerful assumptions: (a) people and systems can adapt and reorganize; (b) complex behaviour can emerge from a few simple rules applied locally; (c) order can emerge without central control, (d) small changes can leverage big effects; (e) events are unpredictable meaning people must trust that things will emerge; and, (f) co-evolution of life proceeds through constant tension, chaos, and balance (McGregor, 2012). Transdisciplinary knowledge is emergent, complex, embodied, and cross-fertilized. The process of emergence manifests when people pass through the zone of non-resistance (accepting there are many Realities) and enter the fertile, temporary middle ground to problem-solve using inclusive logic. The resultant transdisciplinary knowledge is characterized as embodied, a part of everyone who co-created it, rather than discipline-bound or sector-bound. This new knowledge is open and alive because the complex problems the knowledge addresses are alive, emerging from the life world (Nicolescu, 2005). Yes, transdisciplinary problems are wicked. They must be solved, but they are so messy that doing so can make things worse. Yet, people feel they must do something (McGregor, 2012). Transdisciplinary problems include poverty and inequalities, unsustainability, uneven growth and development, human aggression, uneven income and wealth distribution, population growth, the human condition, and any issue with global implications (McGregor, 2009). “Trandisciplinarity starts of with complex societal problems” (Jahn, Bergman, & Keil, 2012, p. 2), which cannot be solved with disciplinary perspectives. Transdisciplinarity is needed (a) when humans interact with natural systems (agriculture, forestry, industry, and megacities); (b) in fields of major technical development (nuclear and-biotechnology, genetics); and, (c) where social, technical and economic development interacts with elements of values and culture (aging, energy, housing, health care, waste management, land, food, water) (Häberli et al., 2001). In the years leading up to the 2000 Zurich conference, there was a growing concern that the problems being addressed by higher education (academic disciplines) were stemming from science and not from the real world. The basic premise of the Zurich conference was that problems no longer emanate from science. The central question at this gathering was “How can research be organized to solve real-world, practical problems as effectively and cheaply as possible?” (Häberli et al., 2001b, p. 20). Those in attendance wanted to know how to do science differently; how to do transdisciplinary research. The Zurich congress concluded that transdisciplinary research is just another type of research that falls within the spectrum of research; that is, it is not a methodology with axioms. Key to the Zurich approach is the assumption that, without question, “the science system is the primary knowledge system in society.” Transdisciplinary research simply serves the role of making sure science “increases its unrealized intellectual potential” (Häberli, Grossenbacher-Mansuy, & Klein, 2001a, p. 4). Wondering ‘Where is the common ground that holds everything together?,’ they concluded that the world needs a science that can live up to the need for universality and that can effectively manage complexity (Klein et al., 2001). To that end, the Zurich conference dealt with new forms of mutual learning involving science, technology, and society to efficiently meet the complex challenges of the 21st century. There was general agreement that the world needs a conscious merger and symbiosis of the perspectives of science, economics, technology, and politics (Mitcham & Frodeman, 2003). Complex challenges of the real world would become the focus of research questions and practices, instead of disciplines being the focus (Klein, 2014). Those in attendance believed that mutual learning is facilitated by building partnerships between academics and non-academics, leading to future transdisciplinary research. There was a distinct concern about the ideal focus of research, with the belief that it should be more oriented to stakeholders and end users in each of science (natural and social), the marketplace, and in government. Mitcham and Frodeman (2003) observed that what is “missing from this ménage à trois are the humanities” (p. 182), taken to mean the classics, history, literature and philosophy as well as the arts. They argued that a transdisciplinarity that resorts to science’s historic tenet of reductionism cannot do justice to the problems of complex systems. Upon reflection, they advocated for a wider disciplinarity (which they said is very rare) that “would step across the divide between the sciences and the humanities and thus at once infect, if not transform, economics and politics” (p. 183). Succinctly, the Zurich approach concentrates on “joint problem-solving of problems pertaining to the science-technology-society triad [and reduces the meaning of] ‘beyond disciplines’…to the interaction of disciplines within social constraints” (Nicolescu, 2006, p. 144). Despite that the Zurich approach entails trans-sector transdisciplinary problem solving, acting within the constraints of something is a perplexing approach, given that trans means across, beyond, and into another space. Mitcham and Frodeman (2003) also observed that those at the Zurich conference “used the term transdisciplinary to cover a spectrum of interactions that are often more finely distinguished as interdisciplinary, multidisciplinary, cross-disciplinary, and transdisciplinary”(p. 181). They insisted that this conceptual slippage muddied how those at the Zurich conference actually understood the term transdisciplinary, thereby compromising future use of the outcomes of the conference. In fairness, adherents to the Zurich approach did confirm they were using Gibbons et al.’s (1994) notion of Mode 2 knowledge production and its definition of transdisciplinarity. Mode 2 has five characteristics, one of them being transdisciplinarity. Mode 1 knowledge is the term Gibbons (2000a) used to refer to the longstanding traditional way of creating knowledge within disciplines, with problems shaped by the interests of the academic community, largely divorced from the world (aka the ivory tower syndrome). Science was built upon a model of knowledge production that has a disciplinary basis, and this disciplinary structure defined what counted as good science and sound, valid and reliable knowledge. Mode 1 is disciplinary; created using homogeneous skills (all the same kind); has strict hierarchies and structures, replete with specializations; and, depends upon blind peer review to determine the quality of the knowledge (Gibbons, 2000a,b). Mode 1 includes “discipline-bound areas of specialization, where the scientist/researcher is often viewed as an independent (and isolated) agent of knowledge, with no need to consult outside the field of his specialized interest” (du Plessis, 2012, p. 42). Mode 2 knowledge is the antithesis of Mode 1, and has six characteristics (Gibbons, 2000a,b; Gibbons et al., 1994). First, Mode 2 is produced in the context where it will be applied. Second, the knowledge that emerges in the context of application has its own distinct characteristics, mainly that it is transdisciplinary (beyond disciplines), with four distinguishing features. (a) The evolving framework for addressing problems emerges in the context of application (not before hand) and entails genuine creativity and theoretical consensus. (b) The solution to the problem is a genuine contribution to knowledge (beyond disciplinary knowledge), with said knowledge creation viewed as a cumulative process beyond disciplinary maps. (c) The diffusion of results and new knowledge is accomplished in the process of their production, and newly formed networks and relationships serve to ensure ongoing communications. (d) Transdisciplinarity is dynamic because it is “problem solving on the move” (Gibbons et al., 1994, p. 5). “Communications in ever new configurations are crucial to transdisciplinary” (p.5) because the new knowledge and new discoveries lie outside the confines of any one discipline or sector. Third, Mode 2 knowledge is heterogeneous in terms of the skills, viewpoints. and experiences people bring to it because so many different sectors are involved in its creation. Fourth, those engaged in Mode 2 knowledge production prefer transient structures and flatter hierarchies than Mode 1. Although not planned, the composition of the group addressing the problem changes over time as requirements evolve. Fifth, the resultant knowledge is socially robust, socially accountable, and reflexive. Everyone must try to operate from the standpoint of all actors involved, which can be challenging when ideas touch values and preferences of different people comprising the research team. And, sixth, the criteria and procedures to ensure quality knowledge are extended beyond peer review to a broader social composition of the review system. Is the knowledge useful? Is it socially acceptable (Gibbons, 2000a,b)? It should also meet the criteria of efficiency and justice and provide a solution to a specific problem. “Knowledge that meets the diverse criteria for a specific situation [or context] is socially robust” (Smith, 2003, p. 4). To continue with the quality control criterion of Mode 2 knowledge, “the participation of a wider range of non-scientific actors in the knowledge production process enhances its reliability” (Hessels & van Lente, 2008, p. 742). This expanded notion of reliability is possible because of a “shift from a ‘culture of autonomy’ to a ‘culture of accountability’” (Nowotny, Scott, & Gibbons, 2003, p.180). Indeed, Nowotny (2003) added an interesting twist, suggesting that in addition to value-added quality, we should start to speak of the value-integrated quality of Mode 2 knowledge. “There is something of a societal value that needs to be integrated into the definition of good science… to produce better science” (p. 50). Briefly and to the point, in Mode 2, multidisciplinary teams are brought together for short periods of time to work on specific problems in the real world to generate applicable findings for the real world. No longer would science work in isolation from the world. The Zurich approach called for context-driven, problem-focused work involving some combination of existing disciplinary knowledge in concert with practitioners who would use the results of the transdisciplinary research. Klein (2001) explained it thus: “a synthetic reconfiguration and recontextualization of available knowledge” (p. 49. emphasis added). The approach to transdisciplinarity used at the Zurich conference is aligned with postnormal science (Klein et al., 1994, p.40). Because Mode 2 was a “new social organisation in science” it needed a postnormal approach (Ravetz, 1999, p. 648). Normal, positivistic science refers to the long established approach to producing knowledge that strives to figure out how the world works, using knowledge generated from the scientific method to inform judgements (McGregor, 2012). Postnormal science was developed as a line of inquiry to accommodate a reassessment of the role of scientific research in public policy. Given the complexity of current policy issues, “[t]here is a need for a scientific practice which can cope with uncertainty, with value plurality and with the decision-stakes of the various stakeholders of the problem at hand” (Hessels & van Lente, 2008, p. 744). Interestingly, although postnormal science shares some characteristics with Mode 2 knowledge production, “post-normal science is only relevant for policy-supporting research, it does not deal with the university-industry interactions” (Hessels & van Lente, 2008, p. 745). Post normal science is concerned with “the public function of research” (Hessels & van Lente, 2008, p. 745) in situations where “facts are uncertain, values in dispute, stakes high, and decisions urgent” (Funtowicz & Ravetz, 1993, p.744 ). Nonetheless, those employing the Zurich approach tend to assume postnormal refers to industry-university-policy-society interactions. Hessels and van Lente (2008) actually maintained that postnormal science has a stronger fit with the revised notion of Mode 2 than with the original version explicated by Gibbons et al. (1994). The second rendition of Mode 2 is set out in the follow up book entitled Re-thinking Science (Nowotny, Gibbons, & Scott, 2001). Only the 1994 version of Mode 2 knowledge production existed during the 2000 Zurich congress. A year later, Gibbons’ team (comprising Nowotny et al., 2001) extended Mode 2 to include the idea of the contextualization of problems requiring participation in the agora (public open space) of public debate (see also Nowotny, 2003, and the Minerva article at Nowotny et al., 2003). They proposed the notion of contextualized science and contextualized research that yields socially robust knowledge because “society now ‘speaks back’ to science” (Nowotny et al., 2001, p. 50). Nowotny et al. (2003) further argued that the great subsystems of state, market, culture, and science are “becoming increasingly transgressive” (p. 190), meaning there is now movement between boundaries. This fuzziness between boundaries created four new characteristics of society and science that they tried to accommodate with a revised Mode 2: (a) uncertainties; (b) self-organization (tied to growth of reflexivity); (b) new forms of economic rationality measured by its immanent, inherent value instead of instrumental value; and, (d) a reconstitution of time and space deeply affecting human relationships, shaped especially by information and communication technology. Despite these conceptual innovations, most scholars referencing the Zurich approach to transdisciplinarity refer only to the 1994 document (Gibbons et al., 1994). Eschewing the extended notion of Mode 2 means notions of transdisciplinarity are truncated. The main goal of this paper was to compare, for the first time in any detail, the two main approaches to transdisciplinarity espoused by Basarab Nicolescu and by those in attendance at the 2000 Zurich International Transdisciplinary Conference, as shared in Klein et al. (2001). Table 2 shares a rudimentary analysis of the main differences between the two approaches. Although they are both concerned with science (disciplines), society, and the complexity of the today’s world, they both understand transdisciplinarity at fundamentally different levels. First, Nicolescu ‘worked out’ a totally new and unique methodology for creating new knowledge to address complexity (with three axioms: ontology, logic, and epistemology). The Zurich group focused on how to do science and research differently so it can accommodate complexity, mainly by disciplines working together within the constraints placed on them by the context within which the knowledge would be applied. Second, Nicolescu’s approach is theoretical in nature and the Zurich approach is phenomenological. Theoretical deals with higher order principles and philosophical axioms while phenomenological deals with application in context. Third, not surprisingly, the Zurich approach focused heavily on research compared to Nicolescu. Research is the systematic investigation of something in order to establish facts, meanings or insights and reach new conclusions. At Zurich, they claimed that transdisciplinarity was just another type of research that falls within the spectrum of existing research while Nicolescu did not conceptualize transdisciplinarity as research but as a methodology for producing knowledge that could be used when conducting research. Fourth, Nicolescu was deeply concerned with the proliferation of disciplines that were creating knowledge in isolation from the world at large. Zurich participants, instead, lauded the many disciplines that attended the gathering, viewing this as strength of the conference and their interpretation of transdisciplinarity. Fifth, while Nicolescu clearly differentiated between transdisciplinarity and its companion approaches (mono, multi, inter), there was conceptual slippage at the Zurich meeting, with less attention given to distinguishing among the four different disciplinary modes. Sixth, the Zurich approach borrowed a conceptualization of transdisciplinarity from Gibbons et al. 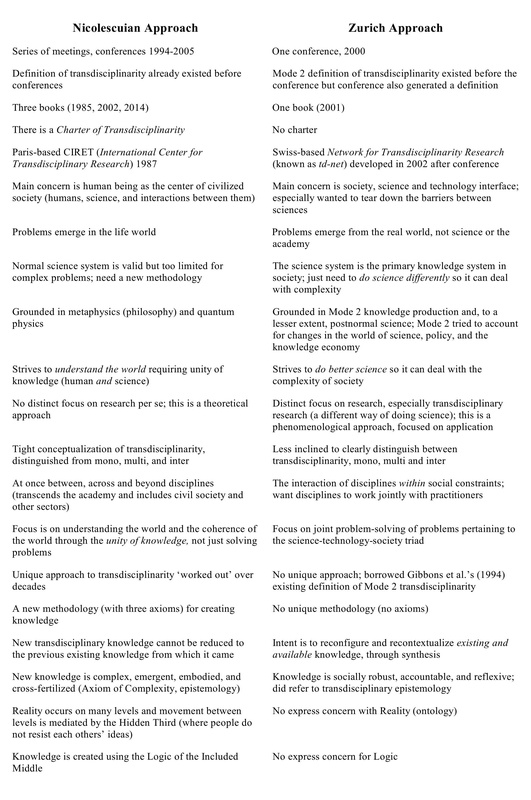 (1994), about how Mode 2 knowledge production defines transdisciplinarity. Nicolescu ‘worked out’ a unique definition of transdisciplinarity grounded in metaphysics and quantum physics (albeit he also borrowed initially from fellow scholars for different elements in his approach). Seventh, Nicolescu understood transdisciplinarity to be at once between the disciplines, across the different disciplines, and beyond all discipline. The Zurich approach narrowed its definition, claiming that transdisciplinarity refers to the interaction between disciplines within social constraints. The latter still focuses on disciplines while the former expands to transcend disciplines, moving to another space entirely. Eight, although both approaches are concerned with addressing the complex problems facing humanity, they differ on the type of knowledge required to do so. The Zurich approach strives to reconfigure and recontextualize existing and available knowledge into a form that is socially robust, accountable, and reflexive. In contrast, Nicolescu holds that new transdisciplinary knowledge is complex, emergent, embodied, and cross-fertilized; this new knowledge cannot be reduced to its old forms. Transdisciplinary knowledge is created using the Logic of the Included Middle. This logic enables disparate ideas to be connected, made possible because of his unique conceptualization of reality (Multiple Levels of Reality mediated by the Hidden Third). The Zurich approach did not concern itself with the axioms of logic, epistemology, ontology or axiology because it did not conceive of transdisciplinarity as a methodology for creating knowledge. On a final note, the Zurich approach focuses on joint problem solving at the science-technology-society triad, while the Nicolescuian approach strives to understand the world by respecting the interactions between humans and science, necessitating the unity of knowledge. Arguing that classical science relegated humans (the Subject) to the sidelines in the name of objectivity (the Object), Nicolescu maintained that understanding the world means connecting the knowledge of humans with the knowledge from the sciences; that is, the TD Subject with the TD Object. Nicolescu bemoaned the fallout of dualism and fragmentation. He saw a place for specializations, disciplinary, and multi and interdisciplinary knowledge in concert with transdisciplinary boundary work at the interface between the academy and the rest of the world. Specializations and disciplines are needed, but they just are not enough anymore. The Zurich approach also values disciplines, respecting the need for them to work in the context where the knowledge would be applied. But, there is no express concern for the Subject and the Object. Indeed, science (the Object) is still deemed to be the primary knowledge system in society. This paper profiled two approaches to transdisciplinarity, Nicolescu’s approach and the Zurich approach. They are fundamentally different despite their shared concern for the complex problems shaping today’s world. The world is better for having both approaches to transdisciplinarity, and as suggested by Brenner et al. (2001), people should “engage in an ongoing dialogue on both of them” (p. 3). This paper contributes to the potential of that dialogue; there is much to learn from the nuances of both approaches to transdisciplinarity. Augsburg, T. (2014). Becoming transdisciplinary: The emergence of the transdisciplinary individual. World Futures, 70(3/4), 233-247. Berni, L. E. V. (2010). The transdisciplinary connection: An introduction to the epistemological approach to improve the dialogue between science and tradition. The Rose+Cross Journal, 7(1), 1-12. Bridgeman, G., & Brooker, G. (2004, January). Transdisciplinarity: History, theory and practice. Paper presented at the International Association of Social Workers conference. Auckland, New Zealand. du Plessis, H. (2012, January 10-12). Communicating science in Africa: Shifting boundaries of perceptions. In Pre-Conference Proceedings of the International Conference on Science Communication for Scientific Temper (pp. 34-46). New Delhi, India: NISCAIR and Vigyan Praser. du Plessis, H., Sehume, J., & Martin, L. (2013). The concept and application of trandisciplinarity in intellectual discourse and research. Johannesburg, South Africa: Real African Publishers. Funtowicz, S., & Ravetz, J. (1993). Science in the postnormal age. Futures, 25(7), 735-755. Gibbons, M. (2000a). Appendix: Some attributes of knowledge production in mode 2. In A. Kraak (Ed. ), Changing modes (pp. 113140). Pretoria, South Africa: HSRC Press. Gibbons, M. (2000b). Universities and the new production of knowledge: Some policy implications for government. In A. Kraak (Ed. ), Changing modes (pp. 34-44). Pretoria, South Africa: HSRC Press. Gibbons, M., Limoges, C., Nowotny, H., Schwartzman, S., Scott, P., & Trow, M. (1994). The new production of knowledge. London, England: Sage. Giosan, L., & Florian, R. (2002). Interview with Basarab Nicolescu. Ad Astra, 1(1), 1-6. Häberli, R., Bill, A., Grossenbacher-Mansuy, W., & Klein, J. T. (2001a). Summary. In J. T. Klein, W. Grossenbacher-Mansuy, R. Häberli, A. Bill, R. Scholz, & M. Welti (Eds. ), Transdisciplinarity: Joint problem solving among science, technology, and society (pp. 3-5). Berlin, Germany: Birkhäuser Verlag. Häberli, R., Bill, A., Grossenbacher-Mansuy, W., Klein, J. T., Scholz, R.,& Welti, M. (2001b). Synthesis. In J. T. Klein, W. Grossenbacher-Mansuy, R. Häberli, A. Bill, R. Scholz, & M. Welti (Eds. ), Transdisciplinarity: Joint problem solving among science, technology, and society (pp. 6-22). Berlin, Germany: Birkhäuser Verlag. Hessels, L. K., & van Lente, H. (2008). Rethinking new knowledge production. Research Policy, 37(1), 740-760. Jahn, T., Bergmann, N., & Keil, F. (2012). Transdisciplinarity: Between mainstreaming and marginalization. Ecological Economics, 79, 1-10. Klein, J. T. (2001). Interdisciplinarity and the prospect of complexity: The tests of theory. Issues in Integrative Studies, 19, 43-57. Klein, J. T. (2003). Unity of knowledge and transdisciplinarity: Contexts of definition, theory and the new discourse of problem solving. In G. H. Hadorn (Ed. ), Unity of knowledge (in transdisciplinary research for sustainability) (Vol 1) (pp. 35-39). Paris, France: UNESCO EOLSS. Klein, J. T. (2004). Prospects for transdisciplinarity. Futures, 36(4), 515-526. Klein, J. T. (2014). Discourse of transdisciplinarity: Looking back to the future. Futures, 63, 68-74. Klein, J. T., Grossenbacher-Mansuy, W., Häberli, R., Bill, A., Scholz, R., & Welti, M. (Eds.). (2001). Transdisciplinarity: Joint problem solving among science, technology, and society. Berlin, Germany: Birkhäuser Verlag. McGregor, S. L. T. (2012). Complexity economics, wicked problems and consumer education. International Journal of Consumer Studies, 36(1), 61-69. McGregor, S. L. T. (2015). Transdisciplinary knowledge creation. In P. T. Gibbs (Ed. ), Transdisciplinary professional learning and practice (pp. 9-24). New York, NY: Springer. Mitcham, C., & Frodeman, R. (2003). Extending science, technology, and society interdisciplinarity. Science, Technology, & Human Values, 28(1), 180-183. Nicolescu, B. (1985). Nous, la particule et le monde [We, the particle and the world]. Paris, France: Le Mail. Nicolescu, B. (2002). Manifesto of transdisciplinarity [Trans. K-C. Voss]. New York, NY: SUNY. Nicolescu, B. (2004). Gurdjieff’s philosophy of nature. In J. Needleman & G. Baker (Eds. ), Gurdjieff (pp. 37-69). New York, NY: Continuum International Publishing Group. Nicolescu, B. (2006). Transdisciplinarity: Past, present and future. In B. Haverkort & C. Reijntjes (Eds. ), Moving Worldviews – Reshaping sciences, policies and practices for endogenous sustainable development (pp. 142-166). Leusden, Netherlands: COMPAS Editions. Nicolescu, B. (2007). Transdisciplinarity: Basarab Nicolescu talks with Russ Volckmann. Integral Review, 4, 73-90. Nicolescu, B. (Ed.). (2008c). Transdisciplinarity: Theory and practice. Creskill, NJ: Hampton Press. Nicolescu, B. (2011). Methodology of transdisciplinarity-Levels of reality, logic of the included middle and complexity. In A. Ertas (Ed. ), Transdisciplinarity: Bridging science, social sciences, humanities and engineering (pp. 22-45). Austin, TX: TheAtlas Publishing. Nicolescu, B. (2014). From modernity to cosmodernity. Albany, NY: SUNY. Nowonty, H., Scott, P., & Gibbons, M, (2001). Re-thinking science: Knowledge and the public in and age of uncertainty. Cambridge, England: Polity. Nowotny, H., Scott. P., & Gibbons, M. (2003). Mode 2 revisited: The new production of knowledge. Minerva, 41, 179-194. Ramadier, T. (2004). Transdisciplinarity and its challenges: The case of urban studies. Futures, 36(4), 423-439. Ravetz, J. R. (1999). What is post-normal science? Futures, 31(7), 647–653. Ravetz, J. R., & Funtowicz, S. (1999). Post-normal science: An insight now maturing. Futures, 31(7), 641-646.
van Breda, J. (2008). Overcoming the disciplinary divide: Towards the possibility of a transdisciplinary hermeneutics. In M. Burns & A. Weaver (Eds. ), Exploring sustainability science: A Southern African perspective (pp. 91-134). Stellenbosch, South Africa: African Sun Media. Voss, K-C. (2002). Review essay of Basarab Nicolescu’s ‘Manifesto of Transdisciplinarity.’ Esoterica, 4, 114-116. Last line of table 2 seems to be missing. Thank you very much for making this comparison. This is a good summary of the origins and development of the two major streams of transdisciplinarity. I was of course disappointed that none of my thirty articles since 2005 on the logic of transdisciplinarity and most recently, its application in the field of information received mention, but so it goes. The good news is that the Nicolescu version of TD is being discussed and applied in venues dealing with information such as the 2015 Vienna Summit Conference. Nicolescu, Marcus and I participated together with leading information scientists and semioticians including Wolfgang Hofkirchner and Sören Brier and colleagues from the People’s Republic of China. As far as CIRET is concerned, I am concerned that the French-English language barrier is a lot higher than I thought or hoped it would be and would hope that ways could be found to overcome it. Thank you. My conclusion in this thesis was “for sure” and I wonder how the authors in his field would respond or if they are still not aware of Ken’s work. It would be a bit of a shame.